The 40th Annual One Show Awards included 554 winners from 34 countries who emerged from a competitive pool of over 11,500 submissions. McCANN/Melbourne secured highest honors by winning Best of Show for its work, “Dumb Ways to Die,” for Metro Trains in The One Show’s “Integrated Branding – Public Service Announcement” category. P&G won Client of the Year for their work with Old Spice, Tide and their “Best Job” campaign that ran during the 2012 Olympics in London. Overall, there were 34 Gold Pencil winners, 38 Silver Pencil winners, 20 Bronze Pencil winners and 462 Merit winners who were honored at Alice Tully Hall, Lincoln Center in New York City. 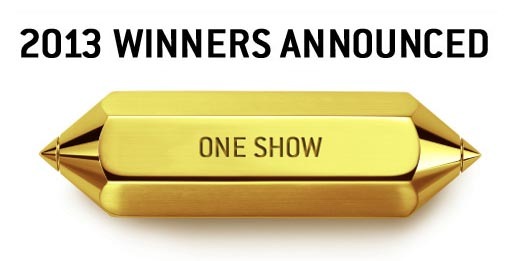 Read on for the full list of One Show, One Show Interactive and One Show Design award winners. Winners of the 16th Annual One Show Interactive Awards include 359 winners from 25 countries who emerged from a competitive pool of over 4,500 submissions. R/GA/New York secured highest honors by winning Best of Show for its work for Nike+ FuelBand. R/GA was also named Interactive Agency of the Year – an inaugural One Show Interactive distinction – that was determined by The One Club’s new ranking system that will be released next week. Overall, there were 28 Gold Pencil winners, 38 Silver Pencil winners, 41 Bronze Pencil winners and 252 Merit winners who were honored at Terminal 5 in New York City. The 13th Annual One Show Design Awards include 274 winners from 28 countries who emerged from a competitive pool of almost 4,000 submissions. Leo Burnett/Chicago secured highest honors by winning Best of Show for its work, “Recipeace,” for Peace One Day in One Show Design’s “Design for the Greater Good” category. Recipeace was a social movement that brought people together over food. The intent was to build awareness for Peace Day on a global scale, while inspiring peaceful action on an individual level. Fifty-nine restaurants in the greater Chicago area participated. Overall, there were 25 Gold Pencil winners, 27 Silver Pencil winners, 25 Bronze Pencil winners and 197 Merit winners who were honored at the IAC building, itself an achievement in architectural design in lower Manhattan.